Food is expensive. 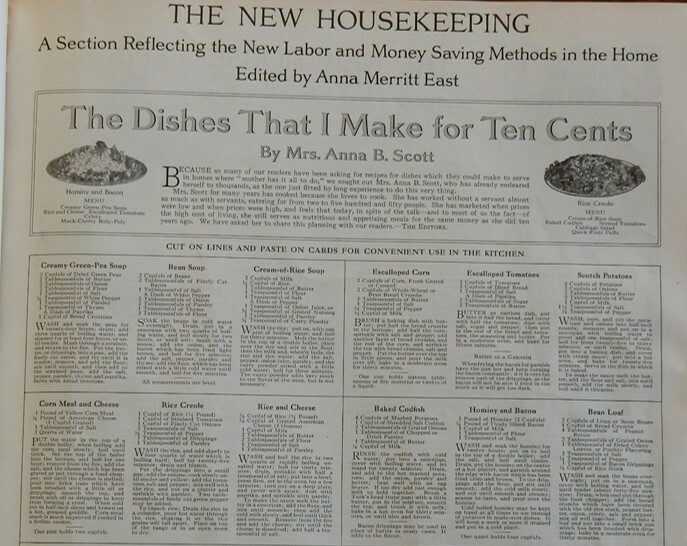 Sometimes I’m shocked by how much I spend when making a recipe, so I was absolutely thrilled to see a page of recipes in the January, 1916 issue of Ladies Home Journal for dishes that could be made for 10 cents. I tried not to get my hopes up too much, but the magazine promised that the recipes were not only inexpensive, but also nutritious and appetizing. I decided to try Rice Creole. I was not disappointed. 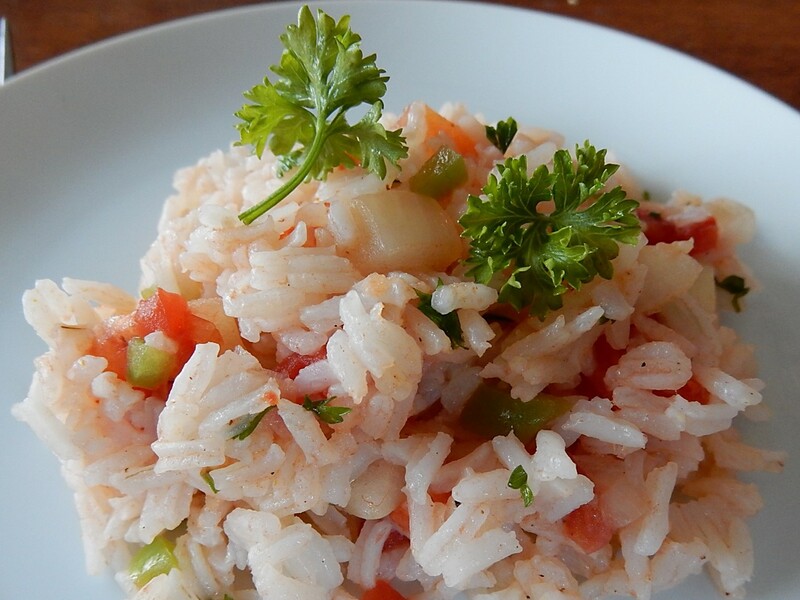 The Rice Creole was simple to prepare, and absolutely delicious. This is a lovely rice-pilaf type dish with a mild onion flavor. And, diced tomatoes with bits of green pepper and parsley interspersed in the rice create a colorful dish that is a perfect accompaniment to fish, meat, or other entrees. Bottom line – Rice Creole is wonderful with a surprisingly modern look and taste. I plan to serve it in the very near future when I have friends over – and I fully expect they will to be amazed when I tell them it’s a hundred-year-old dish. Cook rice following the directions on the package. In the meantime, melt bacon drippings in a skillet, then add onions and green pepper; sauté until tender. Stir in salt, parsley, and tomatoes, and heat until it begins to simmer. Stir in the cooked rice; heat until hot. Since Rice Creole is supposed to be an inexpensive recipe, I decided to cost it out: 1 cup rice ($0.50), 1 onion ($0.50), 1/4 green pepper ($0.32), 1 can tomatoes ($1.29), salt/parsley/bacon drippings ($0.05) for a total of $2.66. It’s a little more than the 10 cents of days gone by, but considering that a dollar in 1916 is worth $22 today, it’s still an inexpensive dish. When I made this dish I used 1 teaspoon of salt (instead of the 2 teaspoons called for in the old recipe), and it turned out perfectly. The old recipe calls for strained tomatoes. It’s unclear whether this means that the drained tomatoes or the strained liquid should be used in the recipe. I interpreted it to mean that drained tomatoes were combined with the other ingredients. Posted on April 17, 2016 April 16, 2016 by SherylPosted in FoodTagged recipe, rice. Wow, love the bacon drippings this rice recipe. It was less spicy than what I expected for a food with the word Creole in its name. That said, I was very pleasantly surprised by its taste. It makes a nice side dish with a mild onion flavor that does not overwhelm the entree. It looks delicious. It’s definitely still an inexpensive dish, but wouldn’t it be great if we could have dinner on the table for only 10 cents?! I make rice a lot like this only … I fry the rice ,onions , peppers in grease or in you want to be ” healthy ” olive oil. Fry the three ingredients until rice goes whiter or less clear and onions are slightly brown then add drained tomatoes but save juice. Then add water, tomato juice and add one teaspoon of salt and one teaspoon of chicken bouillon. Bring to a hard boil then put a lid on pan .. simmer for about 15 mins. , or until rice is soft but not mushy. I also garnish with cilantro instead of parsley. Love rice! You can also use brown rice just cook longer. Your photo is great! Methinks the original recipe writer never had tasted anything Creole. This is to Creole as ketchup is to picante sauce. That’s not to say it wouldn’t make a great side, but it could stand some celery, more bell pepper, bay leaves, garlic, a little cayenne to taste, and some Tony Chachere’s seasoning for good measure! Now that I have that off my chest, I will say that this is very nearly the dish I used to prepare as a base for leftover chicken or roast. I’d cook the rice with chicken broth or beef broth, and it really was good. I think the only difference is that I did add more bell pepper, and some celery. But you’re right that it’s inexpensive, easy, and tastes quite good. The dish you made with left-overs sounds wonderful. This would be good with a little added meat. Yeah and then there is no draining! This is very similar to how I make Spanish rice…strange that it is “Creole”! I don’t know for sure, but maybe there are regional differences in what it is called. I can’t tell you how much I love your blog. I love your take on recipes and the pictures of the old recipes. I’m glad you like it. I have a lot of fun doing this blog, and its always wonderful to hear when someone enjoys it. 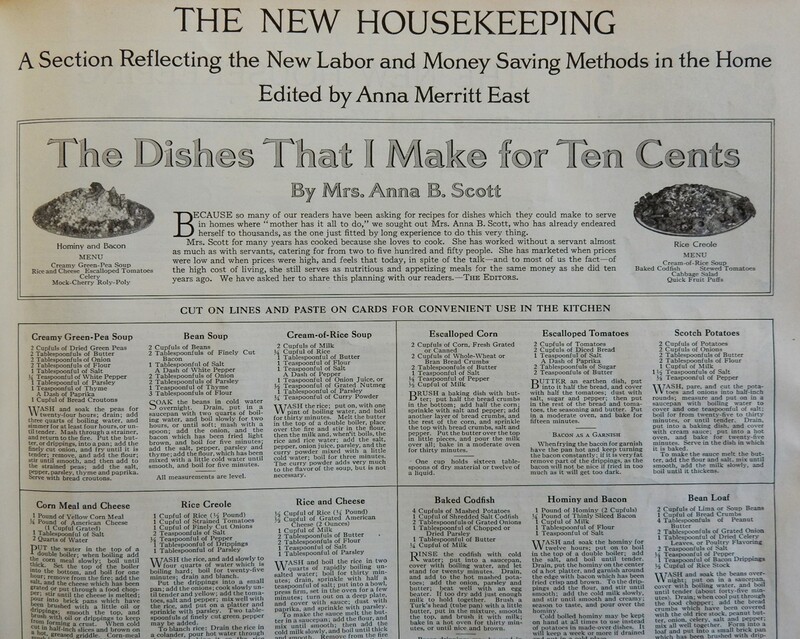 I’d love to see that article with the bottom longer so the lower recipes are readable–they all look interesting and fun! Here’s a link to the photo with the complete recipes. It’s a little blurry, but maybe you read it. I do think this looks very tasty. Perhaps a little cayenne would give it a more authentic Creole taste? When I first looked at the picture I thought it was full of shrimp! Then I noticed the cost and looked closer and realized that was the red from those tomato bits. My mother used to make something similar after we had ham and add ham to the rice. Ham would be a nice addition to this dish. It is a very flexible recipe; and lots of interesting ingredients could be easily added to it. It does indeed sound delicious!! I am going to try this recipe. Thanks for sharing. My mother use to make a similar dish we called red rice, a favorite of mine. 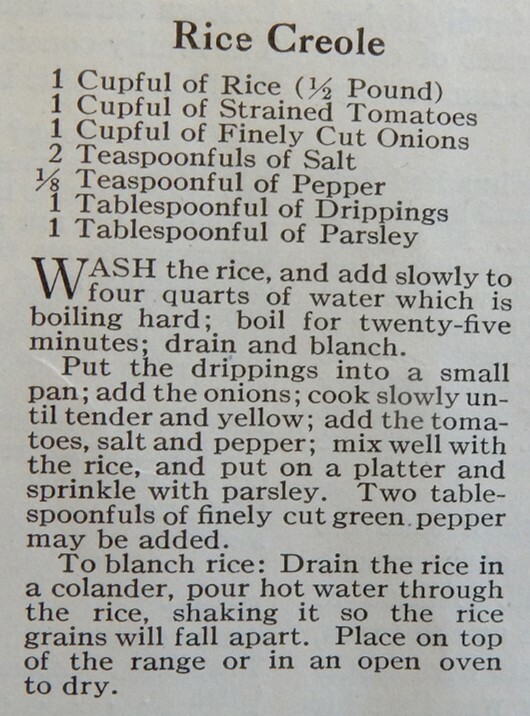 She would add a tablespoon or more of tomato paste to the rice mixture when it was almost finished cooking. The tomato paste sounds like a nice addition. I like the name of the dish–it’s so descriptive. What a great idea! I love recipes like this. Simple is good. Add shrimp, and dinner is served! mmm. . .shrimp would be a nice addition. I agree- some of the best dishes don’t cost very much to make. I’ve never made a cabbage salad quite like the one you described, but I may have to give it a try. It sounds absolutely wonderful. This looks indeed very tasty! Yum!